What should i do or say when an Indian is door-knocking on my door trying to switch my Electricity Provider? Why is Click Energy so much cheaper? Welcome to Queensland Solar and Lighting’s Click Energy Reviews. Having worked in the Retail Energy sector for over 8 years, and several States (NSW, ACT, VIC and QLD) I can certainly share a few secrets of the dirty industry that is ‘retail electricity’. You can type in 471160 for an instant $50 signup bonus. This Click Energy Promo code is valid for 2016 and will entitle you to $50 off the bill! 471160 is the Promo code to use for Click Energy. Click here to sign up to Click energy in Brisbane and Gold Coast today. WHAT? BUT YOU ARE COMPLAINING ABOUT THE CONSTANT RISE OF THE PRICE OF ELECTRICITY! – Surely that’s why your on this site, you want to put solar panels on your roof because in 2014, years after the solar boom started, you finally realise that you can do something about minimising that electricity bill… Keep reading this Click Energy Reviews! Door-to-Door Energy Salesman actually have good things to offer from their bag of tricks. It might pay to rip that ‘do not knock’ sticker off your front door and have a yarn to the next Energy Retailer Rep. Rude homeowners are turning away $100’s of dollars per year and don’t even know it! These door-to-door sales reps are paid between $45 – $110 per sign up – Some of us were easily making $1000+ per night! The reason why there is so much commission paid is because each customer on a retailers books brings the net worth of the company of around $1000 – I was told this by a GM for a Major Company a few years (Energy Australia, AGL e.t.c you can guess) Obviously there is cash to throw around if the benefits are so great they can afford to pay door-to-door sales reps $100 a switch! It does not matter which company bills you as they all bill you the EXACT SAME AMOUNT OF MONEY as one another because the price of power is now regulated in all states by the local Government. For example if the QLD Government say that the price of power is going to be 30c per kilowatt hour used, ALL RETAILERS in QLD have to bill you the EXACT 30c per hour. This is the law. The only way to get cheaper electricity is to go with the energy retailer who is offering the biggest discount off the Government regulated rate. Discounts on Electricity is usually exchanged for signing on to use the energy retailers service for a contracted period of time, usually 12 or 24 months. 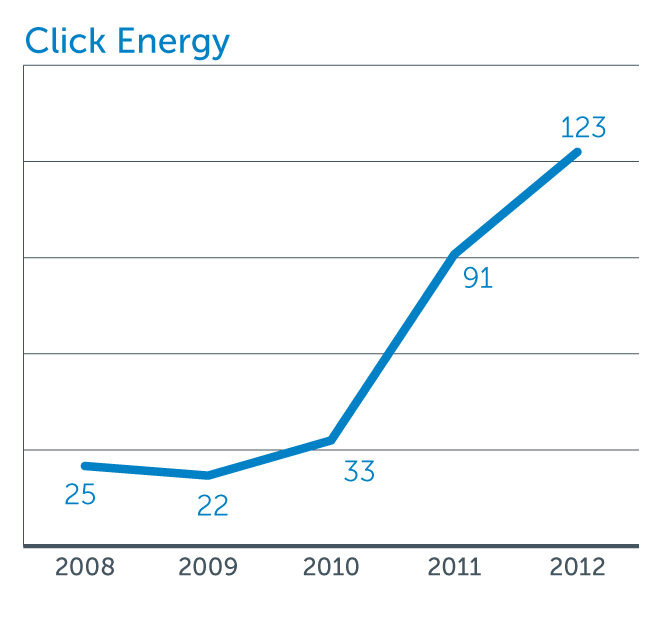 Look at how many more people are signing up to the Click Energy Electricity Retailer. With an extra 10 cents Feed-in Tariff it’s no co-incidence that the graph has the same growath and shape as solar power installs in Australia. No wonder why we see excellent click energy reviews! With the recent abolishment of the QLD Governments 8 cents Mandatory Feed-in Tariff leaves just the retailer contribution solar energy payment for solar power sold back to the grid. This is why we are doing a Click Energy Review. After selling and installing quality solar systems for such a long time in the market we hear whispers of what the Energy Retailers Queensland are paying. Here is a recent study done on Energy Retailers in Australia. Naturally, the Click Energy review was the best. We believe this is the current payments from the major retailers at this point in time, but we are of the understanding that Click Energy is about to bolster their offer very soon to gain more market share and combat the demise of the 8 cents Government contribution. This is also a major reason why we have chosen to do a Click Energy Review. Queensland Solar & Lighting employees all made the switch to Click Energy Gold Coast and Brisbane when we first heard about them and their far more lucrative offers. This is our Click Energy Review Brisbane and Gold Coast. Click Energy is so much cheaper as they are the only Energy Retailer that I know of who operate as strictly ‘online only’. This means they save a lot of money on overheads and infrastructure that other retailers have to incur. You will find so many other Click customers around Australia who are so very happy with more money in their pocket because of the switch, who write glowing Click Energy Reviews of their own.